The site is back up! This is entirely down to the uniquely talented creative director Simon Moore, who created the site in its first, most elegant incarnation (I’ve found the pictures we used for that one and I’ll post them next week). Next we’ll pick a new look for the site and get a few back-end things sorted out that were bothering everyone. What a couple of weeks – a return to full sight for me, a proper London snowstorm of the kind we regularly had until a decade ago, the start of a new novel, the incoming paperback version of ‘Wild Chamber’ and the approaching publication of ‘Hall of Mirrors’, plans to sign in the North of England later in the year, new projects in the offing. Next week I’ll be in Berlin visiting friends, then signing books in London before heading to Barcelona. Not having the blog allowed me to be far more productive on the next novel, so I’ll try to keep these posts down to 4-5 a week in order to maintain my writing pace. 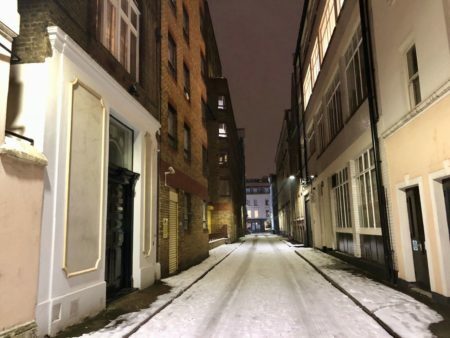 Last night I took a stroll through snowy Bloomsbury to Covent Garden, to meet up with old friends in a cosy pub. Many years ago, when Covent Garden was not an especially salubrious neighbourhood, I nearly bought the house on the left of the above shot. It was run-down and narrow-staired, but very atmospheric. I eventually decided against it when I saw that it never got sunlight. Every time I think the city has lost its uniqueness we get a moment that brings everything back. 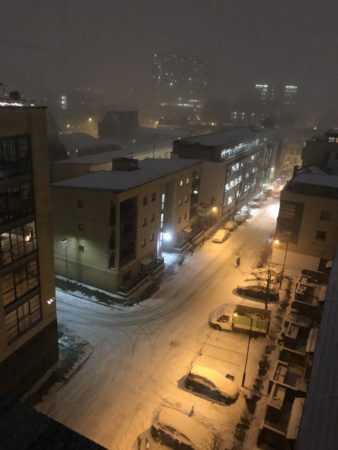 Last night the streets were muffled and deserted. Londoners don’t know how to dress for the cold, and wander about in trainers and summer jackets clutching at themselves, or they’ll stand outside a pub drinking and chatting as if they were in the South of France. I passed this familiar corner – the pub is the one that disappears in ‘The Victoria Vanishes’. Beyond it on the right can be seen the block of flats where Mr Arthur Bryant now lives. Last week I was on the late night tube and it felt like being on a stage set, with everyone greeting each other and various groups breaking into song. That distinctly Dickensian air was in evidence again yesterday. Judge for yourself – and it’s good to be back. Glad your site is up and running again. Thank you. A warm welcome back ! Hey! I know that pub; it’s not far from from the shop where they filmed exterior shots of the shop for the Black Books TV series. It’s been a while since I’ve been in London so I could be wrong – I was wrong once before back in 1977. It’s good to see the blog back, and thanks to all those who made it possible. Better still-it’s fantastic to know your sight is back to normal. Yes! You’re back, Chris. Yeh! I’ve been going stir crazy, with all the snow making it difficult to get about and no blog to read, ( wipes away tears with a delicate lace edged hankie) and I’m nearly out of wine. Aaaaargh. Any news on where you’ll be signing books in London? Looking forward to Hall of Mirrors. Phew! I was getting worried for a while there. I think that’s might be the one were the Fortean Times held a pub quiz a few years ago after the last Fortean Times UnConvention (if it isn’t it was a very similar one in that area). I believe that just ’round the corner is Argyle Street, which was used for some of the exterior shots in The Ladykillers – the ones looking towards St Pancras Station. The Exterior shots of the house were in Frederica Street. And those flats on the right are the ones that I’d guessed are where Mr Bryant lives. Missed the blog. Was getting worried. So glad it’s back. Glad you are back, your daily musings are a great start to the day and thought provoking. Having worked at the Childrens’ Hospital, Great Ormond St for forty years its’s been fun reading about locations in your books that have been a great part of my life. Glad to see you back – for the last few days, I’ve felt quite lost. No witty, informative banter, just an info card. When you say that Londoners don’t know how to dress for the cold, I fear that there may be an entire generation who have lost the knack. In some cases it might be vanity – “I might be coughing up blood, and have trench foot, and my fingers have gone blue, but these artfully torn jeans, bumfreezer jacket, and muslin shirt look fantastic, especially with these fabric trainers”. I’d much rather be warm, so my coat of choice is an army surplus, blue Cold-War era Swedish Civil Defence parka. It’s lined with woolly sheepskin, and cost me about thirty quid. They were made to be handed out to every member of the civilian populace in the event of a major emergency. It’s,beautifully warm, as you might expect. Is it fashionable? Not in the least, being a strictly functional garment, but I love it, especially as mine has the official shoulder badge ‘CivilForsVarget’ on it still, so, for me, it covers several bases; A good winter coat; and a wearable piece of Cold War history. Worn with a cotton Shemagh scarf, a jumper, Moleskin trousers, and 1460 Dr Martens, and a good hat and gloves, you just won’t be cold. Fabulous that you have your site back up and running. I loved this first entry it reminded me of my time spent in London. Maybe a few less entries on the blog wouldn’t be a bad thing if it helps you with your creative writing and productivity. You give more access to your thoughts and feelings than many writers, there aren’t many that have a personal input in a regularly updated blog. I hope to be able to make it to one of your ‘Northern’ book signings it would be great to actually meet you and get my sack load of books signed, just kidding, i’ll only bring my favourite book. Wishing you continued success and it will be nice to see some of the old blog make a return, I loved the old Flash site with all those moody photos of Kings Cross. Glad to see you are back Chris lovely photos of the Cross in the snow. Good to see things back. God bless you tiny Admin, (sorry saw a Christmas Carol recently, and to stay in the spirit of the rail delays and such will read the Signalman, ,Halloa! Below there!’, that there dickens would never get his English GCSE.) and Simon too. My mother in law had an eye operation Monday, it healed very well, she had just the one eye done but can now read without glasses and see colours vividly once more. glad to here your eyesight is back as well. Was at a showing of quilts with a friend and saw some magnificent work. And an organ/piano duet performance this am. Oh! we’re not diarying any more. Hip, hooray! 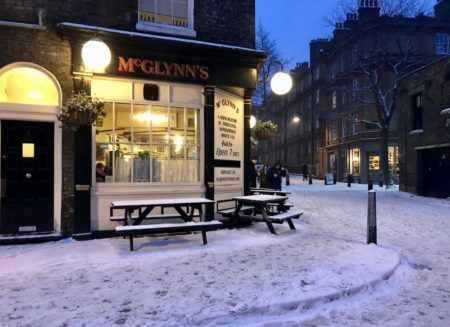 Anyway, my friend showed me some pictures from Dublin where the snow was deep in the streets and the wind had packed the drifts half way up the shop windows. Those were hers “from home” but she also had some video from Russia where the sea was freezing into plates on the beach. The wind was piling them up and you could hear the clatter as some of them slid over the top and fell down the heap. And then there’s the eastern US. So glad you’re back with us, Chris. You saw what we are without your leading. Hoorah! Welcome back. And lo there was much rejoicing throughout the land (and other lands as well). 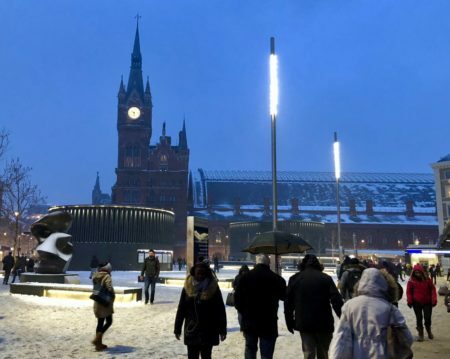 Nice photos of London in the snow too. The older parts of a city are lovely when it snows. Welcome back, snow has it’s own silence!